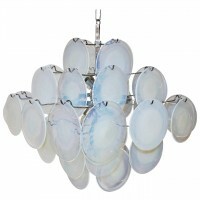 Italian Murano chandelier composed of hand blown opalescent glass discs by Gino Vistosi. Chrome plated metal frame uses 8 – 40 watt max candelabra base bulbs. Rewired. Overall height with chain and ceiling cap 42″ and can be adjusted to suit.